Villa with private pool (7.5 x 3.6) and garden located in Aigua Xelida (Tamariu), 1 km from the city center and the beach in a quiet area. It has 3 double bedrooms (1 with double bed of 135 x 190 and terrace exit with view on the pool, the other 2 with 2 beds of 90 x 200 each), 2 bathrooms (1 with bath, the other with shower), equipped kitchen (vitroceramic, oven, dishwasher, microwave, washing machine), a large living-dining room and a covered terrace. Garage (5x3m). The picture of the beach does not match the view of the house. This is Tamariu Beach, the closest to the villa. 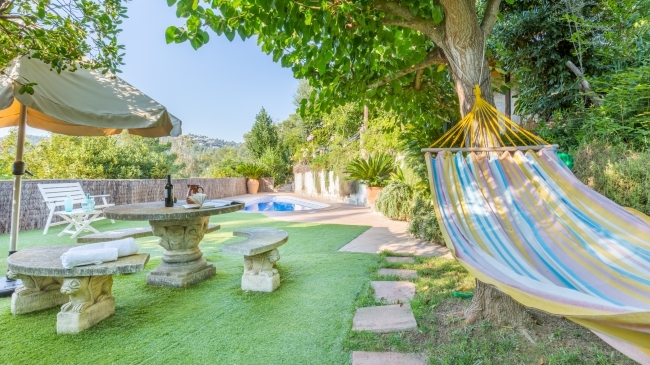 Simple house (150 m2 + 550 m2 for plot) located in Lloret de Mar, 7 km from the beach and the centre of Lloret. It has 3 double bedrooms (2 with double beds (180x200cm); 1 twin bedroom with 2 single beds (90x200cm)) + 2 single bedrooms (90x190cm; 90x185cm),a living-room (fire place),a kitchen (microwave, washing machine), 2 bathrooms + 1 toilet. Private pool (7 x 4 m) and garden, barbecue. Terraces. Parking (2 cars).Views of the mountain and the sea. 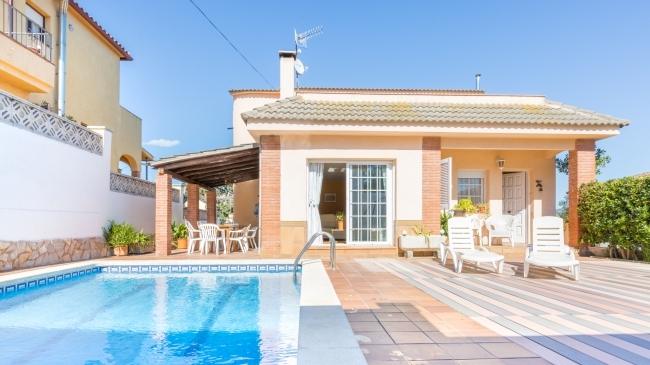 Basic house located in Llafranc 800m from the beach and 850m from the center. With pool and private garden. Outdoor porch with barbecue fully independent work. First floor is distributed in a living room (Tv, fireplace), simple kitchen (fridge, microwave, oven, dishwasher), 2 bedrooms (one suite bedroom), 1 double bedroom (2 single beds), 2 triples, 3 bathrooms (2 with shower and 1 with bath). On the top floor there is a study (accessible by elevator) distributed in living room (Tv), 1 double, 1 bathroom (shower), terrace. large garage (washing machine, 1 bathroom with shower). outdoor terrace with furniture. Sea views.